Close to Saugatuck and South Haven. 110' of Sandy Private Beach. Sleeps 16. 1479 71st. St near Glenn. We don't yet know all available 2019 dates for this property, so calendars are not up to date. Please contact us. We can suggest other properties which are ready to book and let you know the status of this one. We have all fallen in love with this private lakefront property. Loads of space for the whole group to do their own thing inside and outside this charming home and guest house. The outdoor space features large yards, mature shade trees, a lakefront deck, new stairs and landing down to 110' of private Lake Michigan Beach, just 91 stairs. The main house is full of charm and character with wooden walls, a large open living/dining room, lake views, and a cozy sleeping loft with private deck. 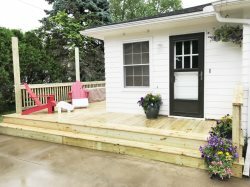 2 full baths and an updated kitchen as well as 2 main floor bedrooms will ensure a great week at the lake. The guest house is close by and has a full bath, living area with a large screen TV, and two full bedrooms with sleeping for an additional 6 guests. Bedroom 1. Main House. Main Level. Queen. Bedroom 2. Main House. Main Level. Queen. Bedroom 3. Main House. Upper Level. Queen and 2 Twin Trundle. Bedroom 4. Guest House. Main Level. Queen. Bedroom 5. Guest House. Main level. 2 Bunks. Bathroom 1. Main House. Main Level. Shower. Bathroom 2. Main House. Upper Level. Shower. Bathroom 3. Guest House. Main Level. Tub/Shower Combo. Your team is wonderful! I LOVED the freedom to check in early and leave late which was given to me at no extra charge. That was truly a beautiful thing. Thank you SO much for that! They were very accommodating, easy to talk with, answered my questions and were super nice on the phone. Such a lovely experience. Thank you! Responsive and easy to work with. Answers my email questions right away. Great place for a weekend of peace, sunsets, lake views, and relaxing. Extremely nice and helpful. I was overly impressed. We had a couple issues and your team responded immediately and efficiently! Amazing views and adorable log cabin. It was a great getaway for us. Your rental agents' help and guidance was perfect and patient in finding the right property for our family. Everyone loved the overall experience that left us with fond memories.